Dr Stone is warmly received by staff at the Pacific Institute of Leadership and Governance. Australia’s Ambassador for Women and Girls Dr Sharman Stone met with participants of the Pacific Leadership and Governance Precinct’s Future Leaders Program to discuss the qualities needed to overcome challenges and champion positive change in the public service, during her recent visit to Papua New Guinea. Participants took the opportunity to ask questions of Dr Stone, who worked as a senior public servant in Australia and then spent 20 years as a Member of Parliament before her appointment as Australia’s Ambassador for Women and Girls. Dr Stone said public servants have to be incorruptible and act with honesty and integrity. “As a public servant you have to be fearless and expert in your advice to politicians,” she said. “You’ve got to have respect for the job that you do and for the policies that you implement. Your personal competency is in your hands and your training needs to be life-long. The Future Leaders Program has been tailor-made to assist Papua New Guinean public servants make the step up to decision-making positions through the development of key skills including leadership capabilities, strategic thinking and policy development. 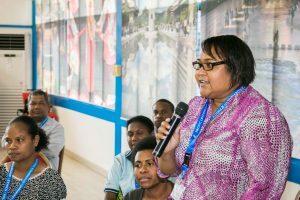 The program is underpinned by Government of Papua New Guinea policies – including the Leadership Capability Framework and the Gender Equity and Social Inclusion (GESI) Policy. 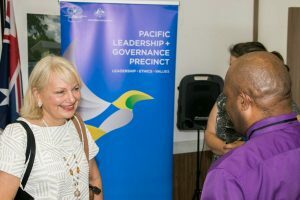 Future Leaders Program participant Wendy Tom Isu, Acting First Assistant Secretary at the Department of Treasury, speaks to Dr Stone about being a champion of gender equity in the Papua New Guinea public service. Women represented 13 of the 25 participants in the third cohort of the Future Leadership Program. Dr Stone said the partnership between Papua New Guinea and Australia is supporting more women to be brought into leadership positons. “We want men and women to stand shoulder to shoulder and share leadership – we want women to be seen as leaders and to become leaders,” she said.